This month's challenge for the PCAGOE lived up to its name again! I had never tried carving, well, that is not entirely true, I had tried, had made a big mess and moved on to better things. So, this time, not backing away from a challenge, I tried again. I knew there were 2 ways to go about this, I could carve on raw clay or cured clay. Having sculpted a bit by making marks on raw clay I tried that first. Getting the work to appear carved, like with a chisel, on raw Premo did not turn out like I thought. The clay is soft and the overall shape gets distorted and I wanted to continue on making bowls and the exercise did not work well. So I baked that so I could compare it to the carvings on baked clay. I was surprised when the cured clay worked out better than the raw clay. It is laborious using those carving tools to take away a little of the clay at a time without taking away too much as not to mar up the design. Carefully, slowly I carved my design into my baked bowl. It was rather zen to slow down and feel the clay through the tool. In this busy time of year, it was an exercise in taking my time which I gravely needed to remind me to relax a little and enjoy my work. My design was inspired by Christmas and this song I heard on Facebook. Reba McIntyre is a favorite country singer of mine and she has this video of a new song, "Pray for Peace". It is a simple melody which sings like a prayer that is repeated often. You can listen if you wish, https://www.youtube.com/watch?v=A29S6cn0nig . I decided to make a bowl that reflected the spirit of the holidays and drew a bird holding an olive branch with the words PEACE on the bottom. It is made to stand on a table with a plate holder. The back is polymerized gauze fabric with silver stars. I find it resembles carved porcelain. I'm quite pleased with it, not only because I taught myself that I can try new things in the middle of my busiest time but also when I look at it, I hear the message of that song and that is comforting to me. So I thank Reba for writing a song that reached me and I'm sure countless others. We could all use more peace in our lives. What a fun bowl... and rectangular, so unique! 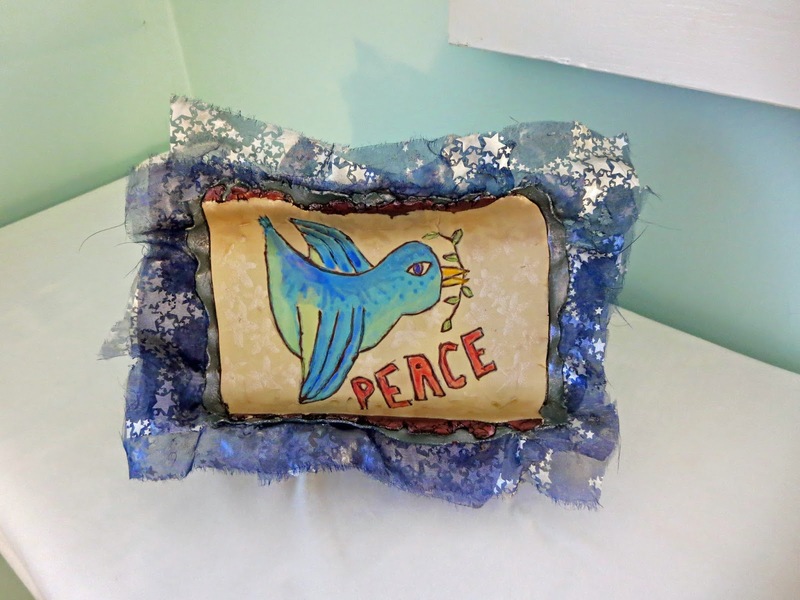 The carved dove and "peace" are nicely done, and I love that you were inspired by a song! Thanks Beth! I love experimenting with fabric too, getting each type to find out what works well and what doesn't.